We know there were a lot of changes made to Rogue One, be that in the script phase, the shooting phase, or the edit phase. That means a pile of stuff ended up not making the final cut. The movie is finally out on DVD and Blu-ray this week, but there were no additional scenes there. So we’ve assembled every bit of information that we could find about what’s missing. The decision to distinguish the standalone Star Wars movies from the episodes by getting rid of the opening crawl was made so early that writer Gary Whitta flat out forgot there was ever a crawl in the script. But in the very first draft, there was a crawl. We know that a lot of changes to Rogue One happened in the final act and that a surprising amount of that footage made it into the trailers. In the final cut of the movie, Jyn, K-2S0 and Cassian Andor get the Death Star plans from one part of the tower on Scarif and then fight their way to the top of that same building to transmit the plans to the Rebel ships. In the original version, the transmission tower and the storage facility were different buildings. So the team had to sprint across the beach to get from one to the other. 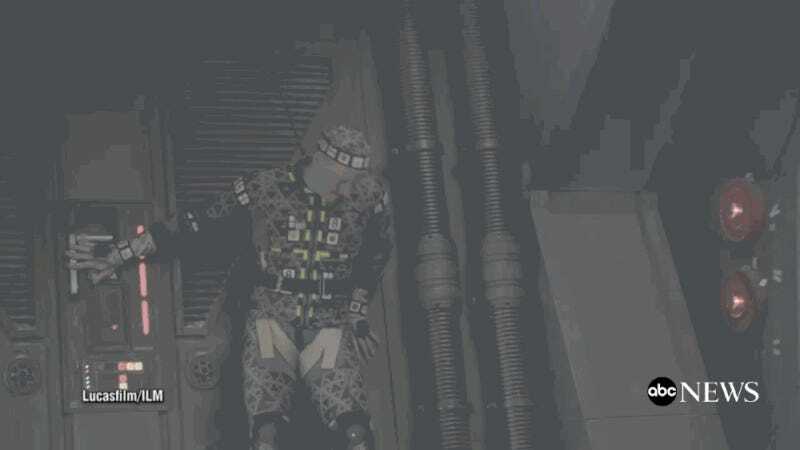 Behind-the-scenes footage showed Alan Tudyk, in his motion capture outfit, being “shot” and falling over (next to what could be Cassian) in front of the base’s doors, it seems like his original death scene was meant to happen after this run got the three of them to door of the bunker. And yet, that’s clearly Cassian on the beach running with Jyn and we even a behind-the-scenes image of Tudyk there, too. So there were a lot of variations on how life ended for these two. Since so many of the Scarif beach scenes were cut when the film’s ending was condensed, we also lost Krennic surveying the carnage. Presumably, his confrontation with Jyn on top of the tower became that character’s big ending confrontation instead of this. At one point, it looks like Darth Vader met with Krennic on board the Death Star, where he’s never actually on the thing in the final version of the movie. The first look at Vader in Rogue One was this shot of the Sith Lord standing in front of the classic Death Star proximity graphic—and it never made it into the movie. We did have multiple, multiple ways of going at any given scenario, we had multiple readings of it. So should they ever decided to, there would be a wealth of ways of approaching these different things. And I know from having seen sort of the crucial kind of scenes throughout it, I know there’s vastly different readings of at least four of those scenes. That makes me wonder if there was a version of this movie where, when Krennic visits Vader on Mustafar, he cowers less and demands more. It would certainly fit with the version that has him striding through bodies on the beach of Scarif. In an earlier version of the script, Darth Vader and Krennic did have one more interaction. Krennic didn’t die in the Death Star blast on Scarif, but was found alive in the rubble. He wouldn’t have stayed alive for long, since his failure would have lead to the inevitable Vader Force-choke. More importantly, Whitta told EW that they’d had to come up with a really complicated reason to explain how someone would survive a Death Star strike. “It’s a bit of a reach, which is why it isn’t in the finished film,” he said. The initial marketing for this movie contained a lot more dialogue from Jyn’s time on Yavin IV with the Rebel Alliance’s leadership. Jyn being asked to state her name and the recitation of her crimes, all of which appears to be missing from the final film. Those bits we never actually saw, but they were voice overs for the scenes of a handcuffed Jyn on Yavin IV. I have no idea why Jyn said “Good” and Cassian responded “Good” in this U-Wing scene, but it’s also missing. “The captain says you are a friend. I will not kill you,” is a cut K-2S0 line. That’s fine, he had plenty of similar ones. Likewise, K-2S0 giving a classic Star Wars calculation of the odds later (97.6 percent of failure) is missing from the final cut. Another bit of dialogue that formed the backbone of one of the trailers was Saw Gerrera saying to (presumably) Jyn, “What will you do when they catch you? What if you continue to fight? What will you become?” A bit of development of Saw in this movie would not have gone amiss. This shot of Jyn partially in disguise became iconic fairly quickly. But it was never actually scripted.  Instead, it was filmed while Felicity Jones was walking between sets and someone turned the lights on. It ended up in the trailer because the marketing team saw the footage in dailies and put it in the trailer. The reflection of Vader, which was the first Rogue One shot of the character revealed at Star Wars Celebration, was shot because it looked cool, not because it was needed for the movie. And finally, like a shocking number of Krennic’s coolest moments, this shot never made it into the film. The scene had ended, but between that and Edwards calling “Cut,” Mendelsohn struck this pose and the “good vibe,” as Edwards called it, made it into the trailer. As it is, Rogue One is stuffed with planets. Jedha, Eadu, Yavin IV, Scarif, Mustafar—it’s a lot of locations. And yet, there was a time when the first set of scenes with the Rebels was going to be on Dantooine—the planet Leia gives up in A New Hope to save Alderaan—before the Rebels flee to Yavin IV. There was also a point where Saw Gerrera’s base wasn’t on Jedha, but a new moon with an atmosphere charged with electricity. Too many planets, honestly. This was a time when budgets forcing cuts probably helped. Also cut? According to the Art of Rogue One, there was a complicated bit where the escape from Eadu included a laser grid that had to be destroyed. A lot of details were cut from the planets, including more of Vader’s Mustafar castle, a more ruined and “mined” looking Jedha (a source of Kyber crystals, remember), a shot of the dish of the Death Star moving from a planet to the ship, and the Jedha “Camel” io9 revealed. If Admiral Raddus—a blue Mon Calamari serving the Rebellion—seemed an awful lot like another famous Mon Calamari admiral who famously pointed out that something was a trap, that could be because Admiral Ackbar was initially meant to appear in Rogue One. Ackbar became Raddus because Ackbar showed up in The Force Awakens and they didn’t want to use the character again so soon. Whitta told EW there were a few other cameos, “but I’m not going to tell you,” Whitta says. “You will write it up and it will become a big deal. It’s not a big deal. They were just little things that we put in there.” So that’ll have to be left up to rumor and speculation. Wray Nerely showing up may not have worked, but a non CGI version of Tudyk showing up might have been fun. The Art of Rogue One reveals that the original version of the team that retrieved the Death Star plans used to have a Jyn Erso who was a Rebel officer. Also, in that version, K-2S0 was an imperial protocol droid instead of a security droid, there was a pilot named Ria Talla, and Krennic was an Imperial spy on the team. There also used to be aliens on the team, named Lunak and Senna. The team was rounded out by two characters called Dray Nevis and Jerris Kestal. 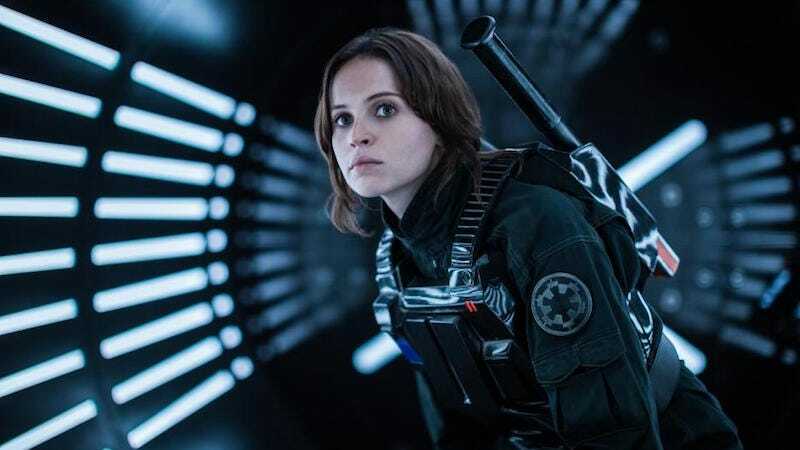 Jyn’s mother, who was revealed to be a kind of Force hippie (believes in it, but is not Force-sensitive) was also at one point an actual Jedi and Bodhi Rook, the defecting Imperial pilot, was originally an engineer named Bokan who worked for Saw. That electrified planet meant Saw needed engineers, so he went out and kidnapped one from the Empire. Ditching that planet—which the team originally crash-landed on—meant changing the character. We also have to put in a word for C2-B5, who was announced with much fanfare on the Star Wars Show and featured in toys, but whom no one can remember actually popping up in the movie. In addition to the ending originally filmed and cut—which had all the beach scenes and the different deaths of the characters— and the ending where Darth Vader killed Krennic, there were at least three more endings that were considered and discarded. In one version of Rogue One’s script, Bodhi, Chirrut, and Baze didn’t exist and Jyn was a stalwart member of the Rebellion. That early script had some casualties, but the major characters of Jyn and Cassian (although he didn’t have that name yet) survived. However, K-2S0 was always slated to die. John Knoll, Chief Creative Officer and Senior Visual Effects Supervisor for Industrial Light & Magic, was the person who initially pitched the story that would become Rogue One. He told io9 that he considered an ending where Cassian and Jyn escaped and tried to use the traffic around Coruscant as cover. They failed, but they transmit the plans to Leia, whose ship is taking off from there, outing her allegiances to the Rebels. And then the two would have blown up their ship so Vader couldn’t torture them. The second possible ending Knoll shared with io9 had Cassian as a double agent who ends up on the side of good for real. In order to save everyone’s life, Cassian would have made it look like Vader’s managed to destroy the ship, but he’d really use a “carbon freeze bomb” to freeze the crew. With no life signs, but everyone actually alive and frozen, the team would have survived. Here’s a hint: it involved carbon freezing. While a lot of the changed chunks are thematic, there are a few scenes that appeared for seconds and then vanished. This image of Krennic hints at a showdown that never happened. He does grab a weapon and go after Jyn and Cassian in the final film, but this particular moment never happened. I think there must have been a bit more on Yavin IV than we saw, because there are images floating around of what might be either posed shots on that set, or stills from scenes that ended up cut. Perhaps to up the tension of the scene by having it play out in silence, Baze’s sniper shot on Eadu isn’t accompanied by him saying,“They destroyed our home.” By that point in actually watching the film, you knew that. This scene where the Rebellion high command looks at a projection of the Death Star also made it into the trailer, but never into the film. This makes sense, since the mission in the movie is to have Jyn find her father, not just the weapon, and the rest of the film is retrieving the plans. While I guess they could have had everyone just trying to find out what’s depicted in the projection, having no shots of it works even better.